I'm back after another two weeks absence, this time primarily due to fighting a nasty cold. The oil experiment also interfered and now I've decided it is over. I did a total of four small oil paintings and have now returned to the acrylics. This seems to happen now and then. I just get the idea that I want to try pastels or oils again but I always come back to my beloved acrylics, maybe my brain will get the message this time and I won't repeat this again for a while. Nothing wrong with oils or pastels, but I just enjoy painting with acrylics more, (usually). 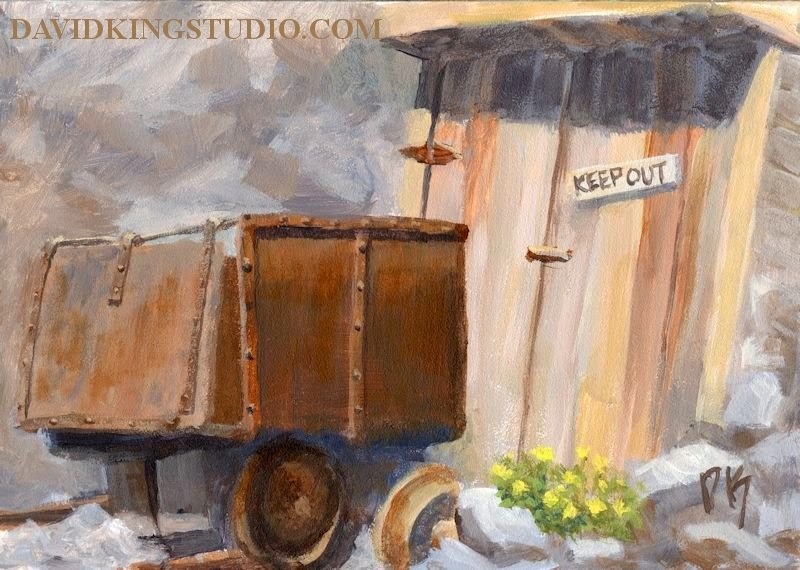 This painting is based on a photo I took in Eureka, Utah of a mining display, (the door doesn't really lead to a mine shaft.). The "Keep Out" sign wasn't actually there, that's my little embellishment. Back to the "selective start" method. In a nutshell this means there is no preliminary drawing or blocking in. The artist selects one element in the painting and paints it to completion and then paints another shape next to it and so on until the painting is finished. The idea is that if the first shape is painted exactly right the next shape can be compared to the first shape to get it correct and so on with each adjoining shape. 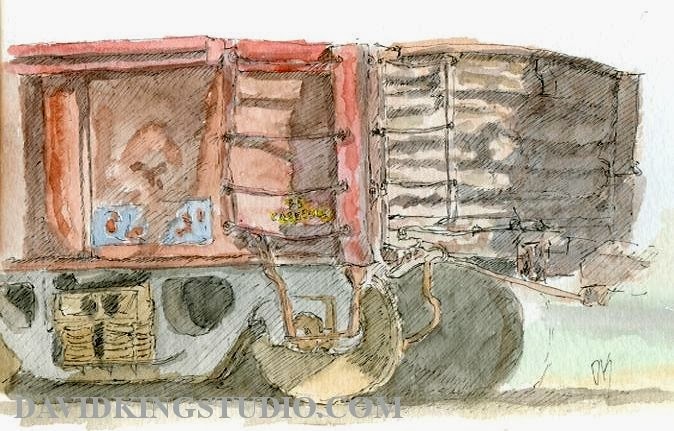 I thought this might be a quicker/easier way to paint vehicles so I decided to try it on this ore cart as a test/experiment since it's simple compared to a truck or tractor. 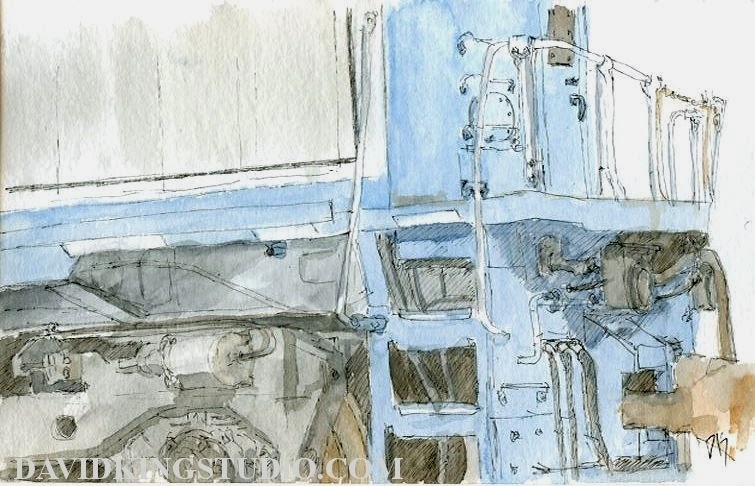 I started just by toning the panel with mixtures of burnt sienna and ultramarine blue. 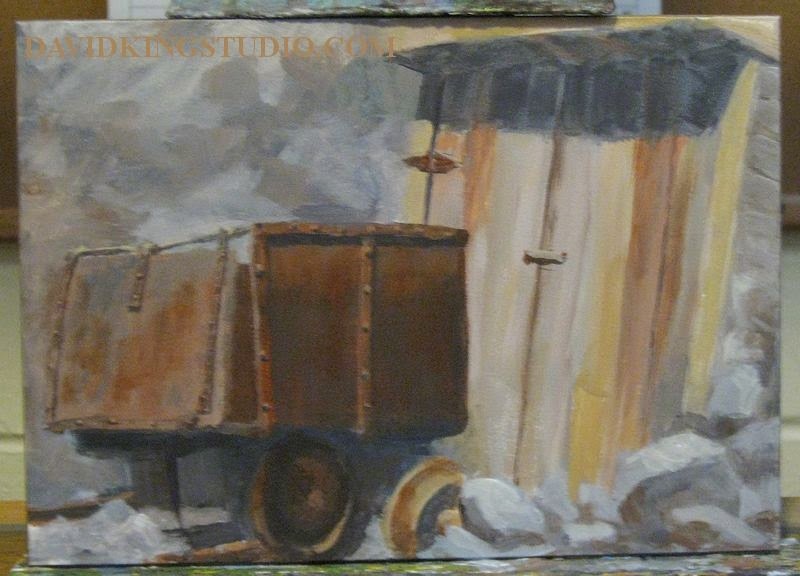 I was tempted to use one of the cart wheels as my first shape to paint but remembered that Schmid admonishes artists to start by picking an easy shape and get that right first, so I started with the mining shaft doors since it's all just straight boards. An adjoining shape that was also easy was the side of the mining cart, it's just a rectangle. However the idea is to paint each shape to completion before moving on to the next shape. Here is where I maybe didn't quite follow the method exactly. I first blocked in the whole side of the cart and then broke it down to smaller shapes. I was trying to keep this painting loose and simple but I just couldn't resist adding those rivets. Next I added the cart door and related details. Finally I got to the cart wheels! This also where I realized a mistake made in the first shapes has hurt me. 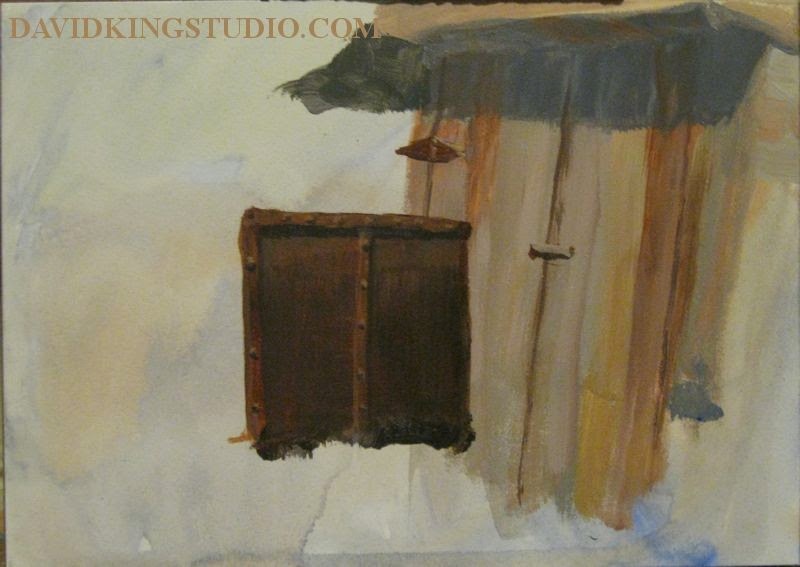 I really meant for the wheels to be above the bottom edge of the painting a bit but instead they ended up right on it. 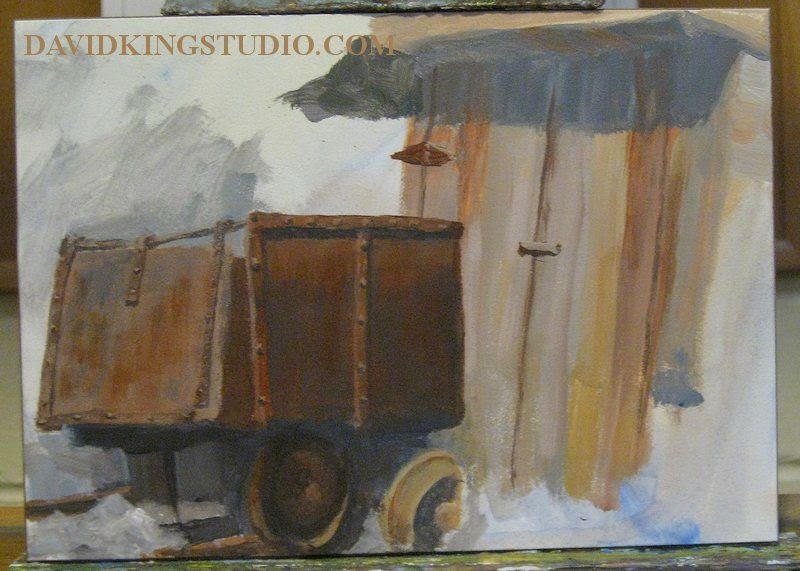 If I had made the mining entrance a bit smaller the painting would have worked out better. Next I added the rocks. Here I deviated somewhat from my reference. The actual scene was built into a large pile of small rocks. I used fewer and larger rocks in the foreground and just suggested a rocky background. This was the last step before the weeds and the sign were added. I think the "selective start" method has promise, I'll definitely try it again. It's been two weeks since my last post, shame on me. That has partly been because I've been contemplating and experimenting about a change in medium and slight change in direction, so things might get a bit weird in her for a while, well not really weird just a bit different. Today the weather was near perfect, a little windy at times but nothing I couldn't handle. 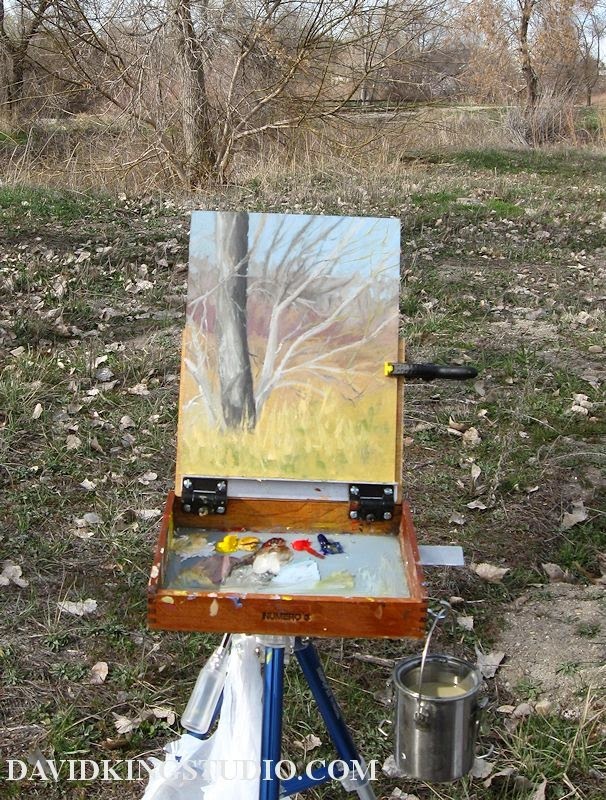 I decided to head out to my favorite convenient painting area, the Jordan River Parkway, there's a twist this time though, I took oil paints. It's been nearly two years since I last painted outdoors with oils. I decided it's time to give oils another go. I want to paint outdoors more often and oils have many advantages to acrylics for painting outdoors so it was time to finally return to them. Bare trees are a challenging subject even with a medium you are familiar with, this isn't my greatest work but it's not a disaster either. 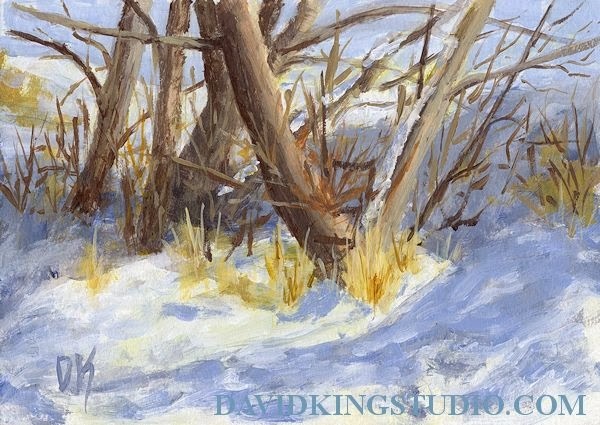 Right now this is the kind of subject that the parkway is full of and since spring will be here soon covering everything up with leaves and bushes now is the time to take advantage to do these little studies of tree "anatomy". I used the same homemade paint box that I used for painting with acrylics, the only difference being the plastic shopping bag used for disposing used up paper towels, oils are messy! I forgot my medium cup which is usually clipped to that little piece of metal on the right side, so I had to just drip some onto the right side of the palette. I used a lot of medium on this one! I tried to use the palette knife more than I'm used to but with mixed results. 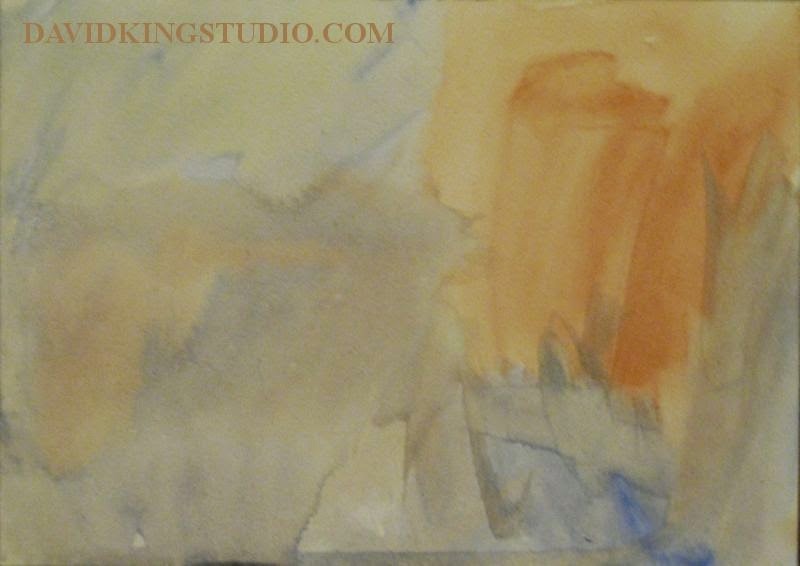 The palette of colors is the same I use in acrylic, titanium white, yellow ochre pale, cadmium yellow pale, burnt sienna, cadmium red and ultramarine blue, all Winsor Newton colors. The medium I use is M. Graham walnut alkyd and the solvent is Gamsol. While Gamsol is less noxious than other solvents it's still strong enough I don't like using it indoors, especially during the winter since I can't open a window. 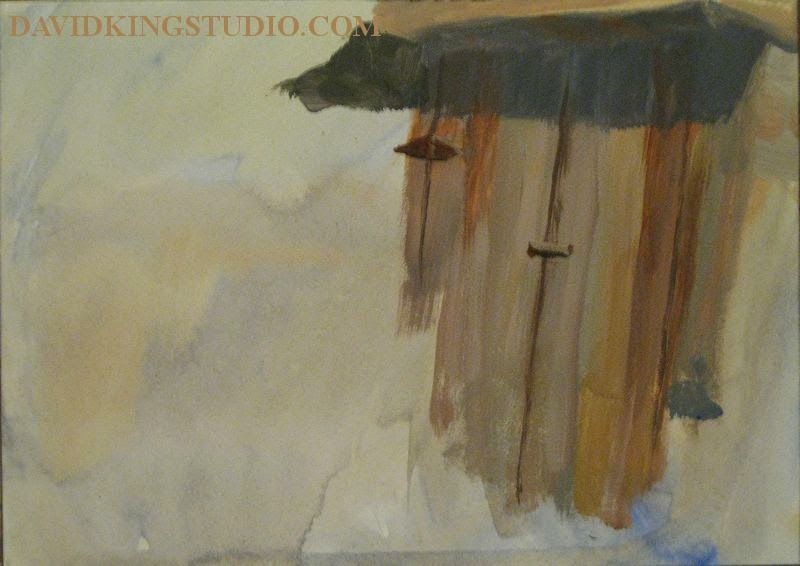 One of the things I've been experimenting with is water soluble oils. 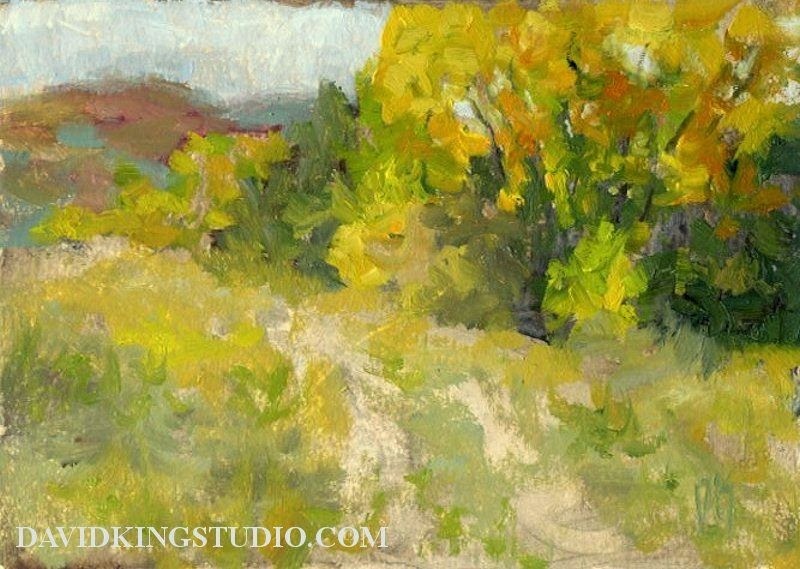 I painted this little landscape painting in the studio using Weber /F.Martin Woils. They were a bit stiff but other than that and being able to clean up using water they worked just like regular oils. 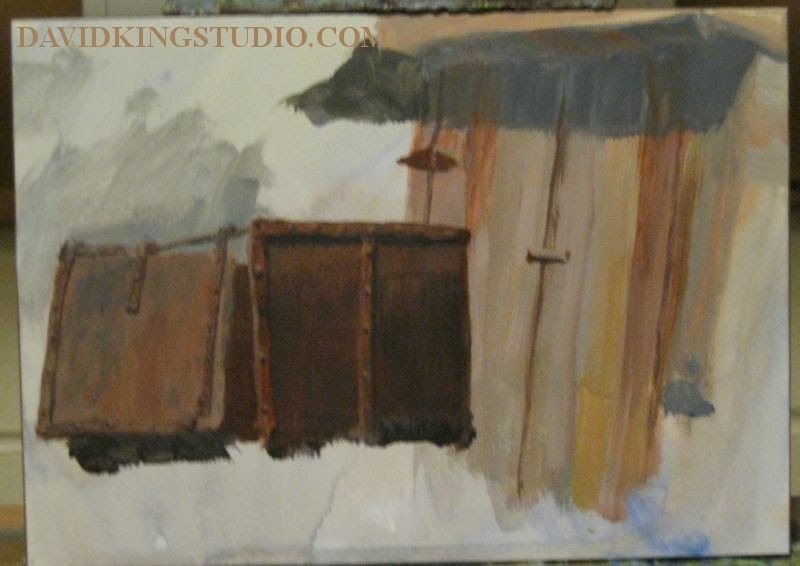 The smell of the oil paint itself is distinctive and something I'll have to get accustomed to. Today was the annual model railroad show at the Ogden Union Station. I'm not a model railroader but I have been a model builder so I appreciate all kinds of scale modeling and this is the biggest model railroad show of the year in Utah so I often attend it. This show is also a sketching opportunity. Ogden Union Station is a museum and there are a lot locomotives, cabooses and railroad cars on display all around the property. I didn't know if I would get the chance to sketch today though, the weather forecast did not look good. Thankfully the weatherman was wrong and we had a very nice day, the only time I was uncomfortable was when a breeze kicked up while the sun was behind a cloud. My biggest challenge today was the clouds, they often blocked the sun at the worst times and I'd have to wait until the sun came back to see the light/shadow patterns. 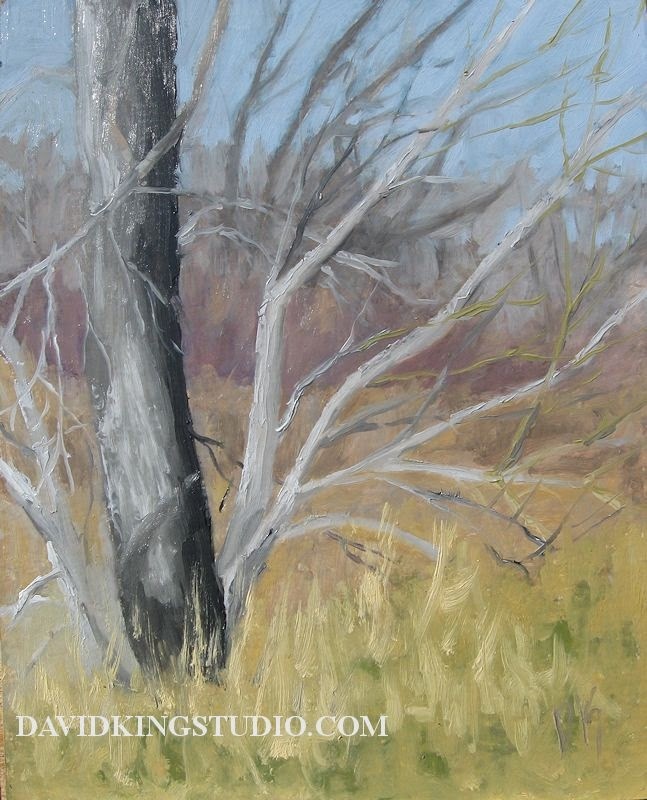 Just off the easel a small painting based on sketches and photos I made/took in December on the Jordan River Parkway.